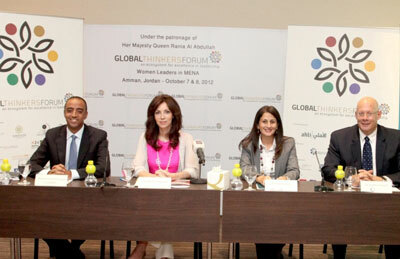 Global Thinkers Forum 2012 (GTF 2012), a landmark event celebrating the region’s leading female thinkers and news makers, has announced new sponsorship alliances with major players including Qatar Airways, Josco, Umniah, and Yahoo! Digital. The conference is being held at Amman from October 7 to 8 under the patronage of Queen Rania Al Abdullah. It is a response to the leading positions some women are now taking across communities in the region, while celebrating the current roles and life stories of successful women leaders across professional and public life, said the organisers. Confirmed speakers and GTF award honourees include: Princess Rym Ali of Jordan, Princess Sumaya bint El Hassan, British Ambassador to Jordan Peter Millett, Arianna Huffington, Fadi Ghandour, Deema Bibi, Professor Saskia Sassen, Majd Shweikeh, Dr Hayat Sindi, Dr Usama Fayyad, Wael Fakharany, Marianna Vardinoyanni, Professor Safwan Masri, Jumana Twal, Margery Kraus and Reem Bsaiso. Elizabeth Filippouli, GTF 2012 founder & CEO, said the forum has become an essential platform for the region and its women leaders. "We are delighted to help leading brands who want to show their true colours and demonstrate their responsibility to the community. The forum also offers rich opportunities for media professionals looking for original stories from the region," she remarked. This year the forum has inked new sponsorship alliances with Qatar Airways, Josco, Umniah, Anna Lindh Foundation, Bidaya Corporate Communications, Yahoo! Digital, U Magazine, Play FM and Ro’ya TV. Umniah CEO Ihab Hinnawi said, "Our partnership with the GTF 2012 as the strategic telecom partner is in line with our commitment to support our community, and reach out to the different segments in our society." "We at Umniah always encourage creativity and innovation, with a particular focus on Women and Young entrepreneurs, and we strive to offer them the right economic and social conditions that will nurture their growth; this forum is an important platform and will definitely contribute to that," he remarked. Hinnawi confirmed the importance of the topics that will be discussed during this year’s forum driven by its unique umbrella theme. Jumana Twal, the founder & CEO of Bidaya said ‘The Mena region has no shortage of strong women leaders; what it lacks is large-scale, visible platforms that are capable of advocating a progressive socio-political stance on women’s roles, showcasing inspiring success stories and opening the door for effective peer networking." "That is why bellwether events such as GTF 2012 are so important, and we at Bidaya are proud to be involved," Twal said.